Finissage of the Stadion X: Episode 1: BONIEK! 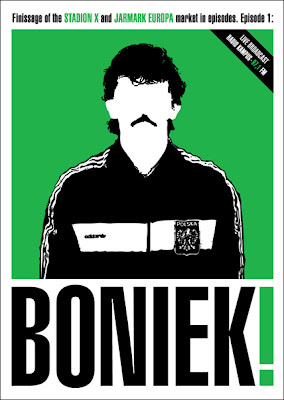 Swiss artist Massimo Furlan recreated a famous polish soccer game from the perspectiv of its best player – Zbigniew Boniek. 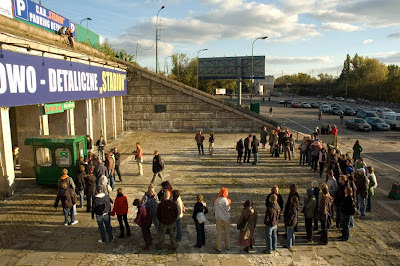 Furlan appeared on the derelict Warsaw Stadium as a solitary player reproducing the choreography of the great polish footballer. The original coaches were present on the assisting bench. There was no ball and no referees. The match was commented live by Tomasz Zimoch – brilliant polish sport commentator. Furlan as Boniek deftly followed the action perfectly sinchronised with Zimoch’s commentary. The 700 people audience (in majority coming from the art crowd, therefore have never attended a real match) within five minutes started acting as football funs. A remake took part in Stadion X just before its demolition and transformation into a new Olympic center. Action opened a series of perfomativ events the Finissage of Satdion X and Jarmark Europa Market– the biggest and spontaneous market in Eastern Europe around the symbolic stadium created over the debris of Warsaw uprising.